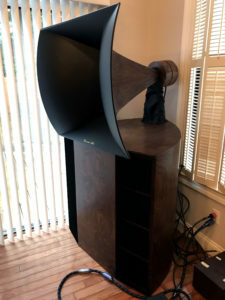 The Destination Audio Vista Horn firmly belongs in the big speaker category at six feet high, nearly four feet across and five hundred and forty pounds heavy. At $95,000 the pair, the Horns are beyond the reach of all but the privileged few. One would have to have a big house in the first place to accommodate these speakers, and they are to be placed in corners of the long wall. And once in place, these behemoths are unlikely to be moved again. As a previous owner of the Tannoy Westminster Royal SE, the largest Tannoy in the British company’s Prestige series, I wasn’t eager to have another pair of behemoths. Thirty-eight inches wide, twenty-two inches deep and fifty-four inches tall, the Tannoy was a monolith on its own and the Destination Audio was bigger. While the Tannoy looked more like a large cabinet of furniture grade wood veneer, the Destination Audio appeased with no less elegant a large, bass cabinet with two full-height front flaring to the left and the right, supporting a huge midrange horn as befitting theater systems of the fifties. The Vista seemed to pay homage to the horn constructions of both Pual Klipsch and JBL Engineering which were the inspiration of his designs, although the Vista was quite different with completely reengineered, new constructions from the ground up. For one, it weighed over twice as much as any of those others. The Vista’s 42 inches wide and 41 inches tall bass horn cabinet housed two 16-inch rear-firing woofers. The woofers were made of Alnico magnets with fabric suspension, paper cones and 16-inch baskets. Each woofer was custom made by hand exclusively for Destination Audio. 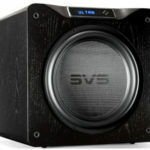 Each woofer featured a 99dB efficiency and the two were connected in parallel to achieve an additional 3dB increase. 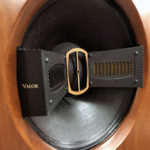 Furthermore, the bass horn cabinet design amplified the 2:1 compression of the woofers to yield 3dB more of output to arrive at a final efficiency of 105dB. The Vista midrange horn at 34 inches wide, 32 inches tall and 41 inches deep was based on the JBL 2360 constant directivity horn. The sound radiated from the CD horn through a narrow opening, creating a more dispersed and less directed and aggressive presentation. Sam likened the method to a garden hose when it is squeezed at the tip to create multiple, smaller jet streams. This is where the similarity ends. Sam viewed the JBL original horns’ construction material of epoxy resins as undesirable in his quest of the 45 sound, for the thinner horn material caused resonances. 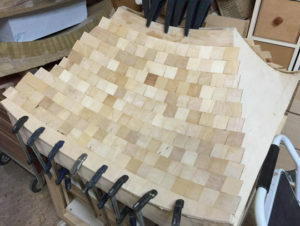 He had to resort to wooden elements of increased thickness so as to obtain a ‘more natural and organic sound with controlled vibration of the horn.’ As a result, mixtures of wood from deciduous trees consisting of about 2,400 elements were used in the construction. 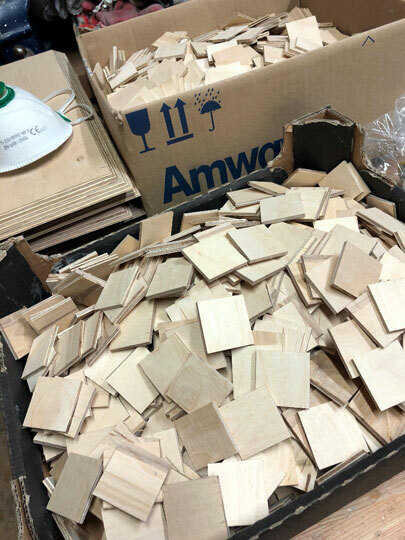 The process began with the building of, per Wisniewski, a ‘negative form’ of the horn in solid wood. Wooden tiles ranging in dimensions from about 0.5 inch to 1.5 inch were layered one by one all over it. After achieving the specified thicknesses, a final layer of wooden pieces of nature veneer in the shape of a leaf was made and laid atop. The driver for the midrange horn was a modified 1970s JBL, utilizing new old stock diaphragm and Alnico magnets. The resultant driver was specified to have a 118dB efficiency and dampened by 6dB to output 111dB via a German-made autoformer. The horn rolled off naturally at 6,300 Hz to the tweeter and utilized only one capacitor to roll off at 430 Hz to the woofer with a 6dB per octave first-order filter. Sam could only build a few of the Vista horns per year. Included in the purchase is on-location adjustment of the midrange horn at the customer’s home on the horizontal and vertical axis during installation, so as to optimize the sound at the listening position. To isolate the bass horn from the midrange horn, the colossal midrange horn was suspended midair via a single ultra-strength spine column integrated into the back of the enormous, 28 inches deep woofer cabinet, and pointing slightly downward. When listening to most other speaker systems, on-axis experience of the drivers on the same height as the ears on a couch is crucial; off-axis effects are detrimental to a proper experience of the speaker system. 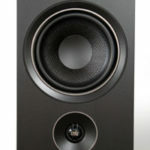 Pointing drivers mounted high on a large speaker downwards to a presumed listening distance and height is the most common practice among manufacturers to ensure as close to on-axis listening of their speakers by the customer as possible. 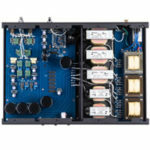 For the top-end, a JBL 2404 tweeter horn was selected with a 12dB second-order crossover roll off at 6,300 Hz and expired naturally at 19,000 Hz, plus and minus 3dB, or 21,500 Hz, minus 10dB. This JBL tweeter was installed in the upper left corner inside the woofer cabin for the left channel, and the upper right corner for the right channel. Integrating the extraordinary capabilities of these three drivers into a cohesive whole was a tri-wiring outboard crossover housed in an unceremonious wooden box 15 inches long, 5.75 inches wide and 7 inches tall. Each long side of the box was adorned with three pairs of WBT speaker terminals, with the amplifier side labeled HIGH IN, LOW IN, NON-USE, and HIGH OUT, MID OUT, LOW OUT on the speaker side. Each input was run on its own, independent signal path; Jupiter VT and Duelund VSF capacitors were used and wirings were via 12 AWG Anticables air coil copper ribbon wires in paper wax insulation. The space in my house in which the Destination Audio Horns performed was the main living room, measuring 24 feet long, 17.5 feet wide amounting to 420 square feet, with an angled ceiling that rises from 15 feet on the right wall to 22 feet on the left wall. During installation, Sam estimated the room’s width correctly by eye, at 17.5 feet precisely! Acoustics of this room is mitigated by 10 feet tall blinds on the side walls and Savannah-styled window blinds behind the speakers. The blinds were all turned towards the speakers during auditioning to create absorptive surfaces, creating a mitigated acoustics suitable for listening. The Vista horns were slightly toed-in when installed by Sam and Art, and what an expertly arrangement that was. The Vista’s toe-in angle accorded a large sweet spot while the horizontal dispersion of the horn was such that it enabled a standing listening position just as appropriately as that on the couch. The herein extent of freedom accorded by the Vista horns could not be overstated, I was able to stand behind the couch and work on my laptop using my standing laptop desk and still be in the sweet spot. While my listening room was relatively large, the Vista horns with its highly dispersive method should perform comparably in rooms from 14 feet wide and up. What an informative and very well written article. Being a horn/tube owner, it was easy to understand and concur with your conclusions. It would have been nice to compare this gear with the equivalent Audio Note pieces, but not easily possible. Constantine, what an informative and very thorough review of such a big and imposing horn and tube system. I listened to them at the California Audio Show last year and thought they had huge potential. Knowing your ability to dial in a system in your room it was easy to understand your conclusions. I would love to bring over David Bearning’s latest ZOTL MZ5 1 watt pure class A tube integrated amp and hear these speakers. It drives my 104dB speakers to real rock levels. Thanks for such a great review. As a lucky owner of those magnificent speakers I can only say kudos to the reviewer. I just moved and after a 2 year gap – I am re installing the DA system in my new living room tomorrow. What a day it will be ! Sam pozdrawiam Cie serdecznie ! Thank you for the kind words. Especially from you Lukasz.